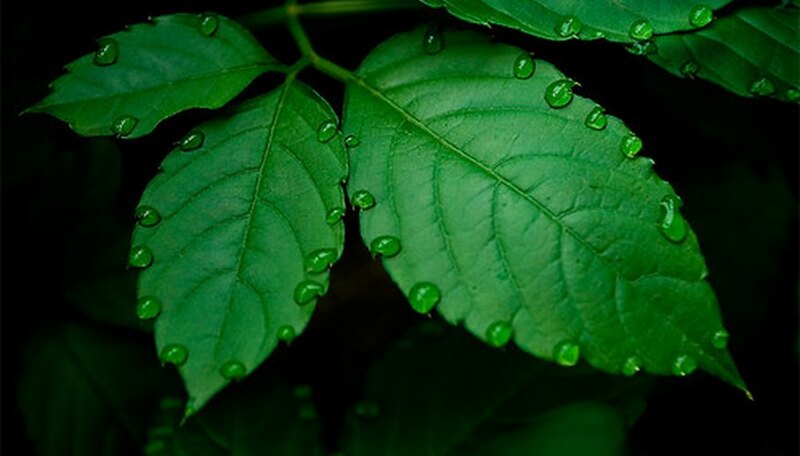 Leaves conduct photosynthesis in plants by using energy from the sun to combine carbon dioxide from the air and hydrogen from water to form nutritive sugars needed for growth. Plants have evolved leaves in different shapes and sizes to enable them to conduct photosynthesis in numerous environments. One way to know the variety of plant is to identify its leaf. Broad leaves are wide and usually have a visible network of veins. In temperate areas, these are usually leaves of deciduous trees that drop in the fall. Apples, oaks and maples are examples. In the tropics, trees with broad leaves may stay on the tree and remain green all year-around. Slender, narrow leaves don’t have a blade. These include needles of evergreens such as pine trees, fir trees and junipers. Some trees, including types of spruce and cedar, have thin leaves that resemble scales. A leaf has a bud at the base of the stalk; a leaflet does not. A leaf with just one blade is a simple leaf. Red maple and white alder are examples. Compound leaves such as those found on the paperbark maple or thornless honeylocust can have more than one blade on a leaf. Palmately compound leaves have three or more leaflets attached like fingers to the end of the stalk. The horse chestnut is an example. Pinnately compound leaves have several leaflets attached along one stalk as is the case with the American yellowwood. Alternate leaves are those where one leaf is attached at a single node, or location on a stem. These leaves can alternate opposite one another or they can spiral around the stem. Alders, elms and oaks have these kinds of leaves. Opposite leaves have two leaves opposite one another on a single node. Ash, dogwood and redwood trees have opposite leaves. A whorled leaf is where two or more leaves radiate from a node-like spoke on a wheel. The redvein enkianthus, a shrub, has whorled leaves. A lobe is curved or rounded projection. A shallow lobe and deep teeth are similar, although a lobe often has a visible vein; teeth may not. Leaves of maples and the Oregon white oak have lobes; leaves of the eastern redbud do not. The edge of a leaf is called the margin. Leaves with smooth margins are called entire leaves; leaves with small notches in the margins are called toothed leaves. The white forsythia has entire leaves. There are several types of toothed leaves. The paperbark maple has leaves with coarsely toothed margins. Serrate means that the teeth point forward. There are single serrate leaves, double serrate leaves, spiny serrate leaves and dentate, meaning that the teeth do not point forward. Single needles are attached directly to the twig as is the case of fir and spruce trees and the coastal redwood. Bundled needles are where two to five leaves are attached to a twig in a bundle. Pine trees usually have bundled needles. Clusters of needles are where from five to 30 or more needles are bundled to a twig. Some cedar trees have clusters of needles. A lens or low power microscope is often needed to identify scalelike leaves. There usually two to four small, short, overlapping scales per node. They are found on junipers and western red cedar, among other trees.